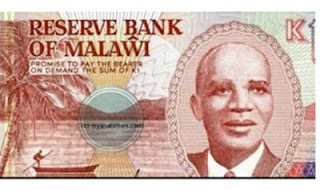 Malawi will have its founding president Ngwazi Dr Hastings Kamuzu Banda’s face on its new 1,000 Kwacha (about $11) banknotes . In Namibia banknotes featuring former Namibian President Dr Sam Nujoma are now available. The new N$10 and N$20 banknotes feature the portrait of Nujoma. According to the Reserve Bank of Malawi (RBM) the new bank notes will be in circulation in July.Initially the new bank notes were to bear late president Bingu wa Mutharika’s image . The late president proposed to have his face on the bank notes t o put him at par with his predecessors Kamuzu Banda and Bakili Muluzi who left their marks on the national notes, but this has been scrapped. Malawi would also phase out its old K20, K50, K100, K200 and K500 notes. The 500 kwacha note will bear the face John Chilembwe, Malawi`s first formal nationalist and freedom fighter who is currently on the bank notes.The 200 Kwacha bank note will be embossed with Rose Chibambo`s face (Malawi’s first female cabinet minister only person alive on our bank notes) and reprint 100 kwacha notes stamped with the face of Inkosi Gomani II.